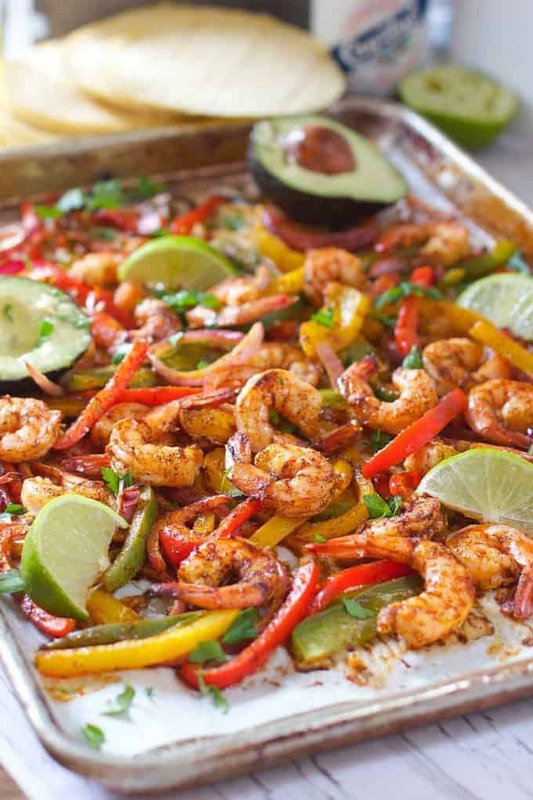 Sheet Pan Chili Lime Shrimp Fajitas are made with whole some ingredients with a flavor your whole family will love! Who doesn’t want tacos for dinner! as are made with wholesome ingredients that come together in a flash. Your whole family will love this quick cooking dinner! 20 Minute Dinner guys! Ten minutes of slicing, ten minutes of baking, and you will get these yummy Sheet Pan Chili Lime Fajitas on the table! Pile them onto a salad, or wrap it all up in lettuce or warm tortillas. Top them with all your fave mexican condiments like salsa, sour cream, and avocado of course! 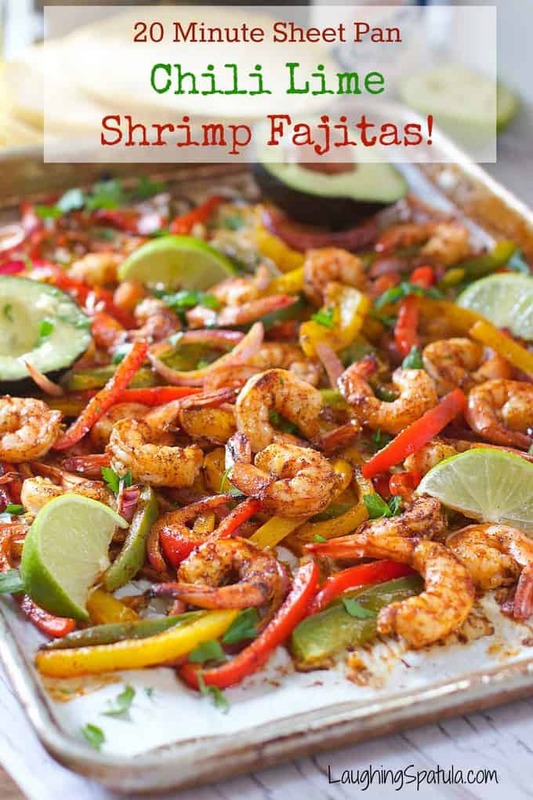 These are just as tasty as my Chicken Sheet Pan Fajitas, Salmon Sheetpan Fajitas or Mahi Sheetpan Fajitas….and that’s no sheet! (come on…like I can even help it…). You simply combine a bit of olive oil, lime juice and some spices. Pour it into your shrimp and veggie mixture, toss it all on a sheet pan and you are done! 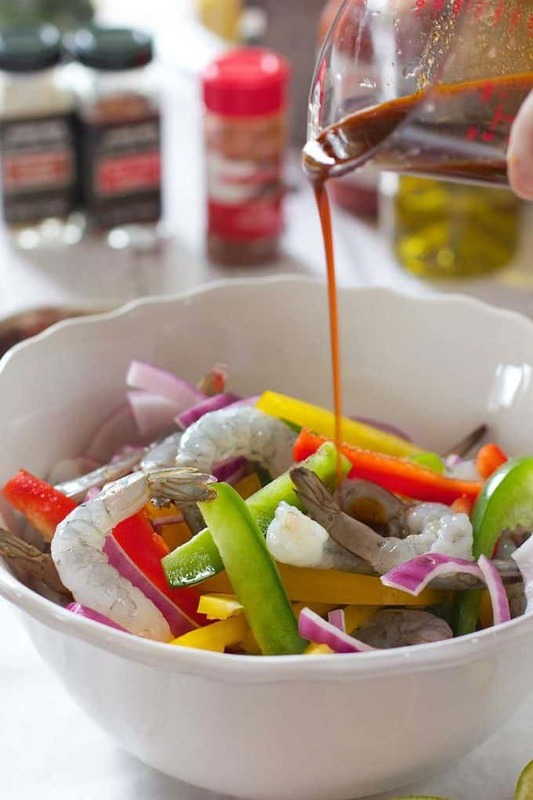 Slice the veggies on the thin side so they cook up at the same time as the shrimp. I am not a big fan of spicy but if you are, kick up the marinade with a bit more crushed pepper and throw a jalapeño into the veggie mix. I buy my shrimp at Costco. 31-40 size. Raw with tail on. The tails are easy to pluck off before or after cooking. I leave them on ’cause I like the way it looks :). Make sure and save some for your lunchbox tomorrow. I love this chilled and on top of salad! Serve it up with a side of Spanish Rice or Fresh Corn and Avocado Salad to round out the meal. To Taco Tuesday, Wednesday and Thursday! 20 minutes from start to finish, including cook time! 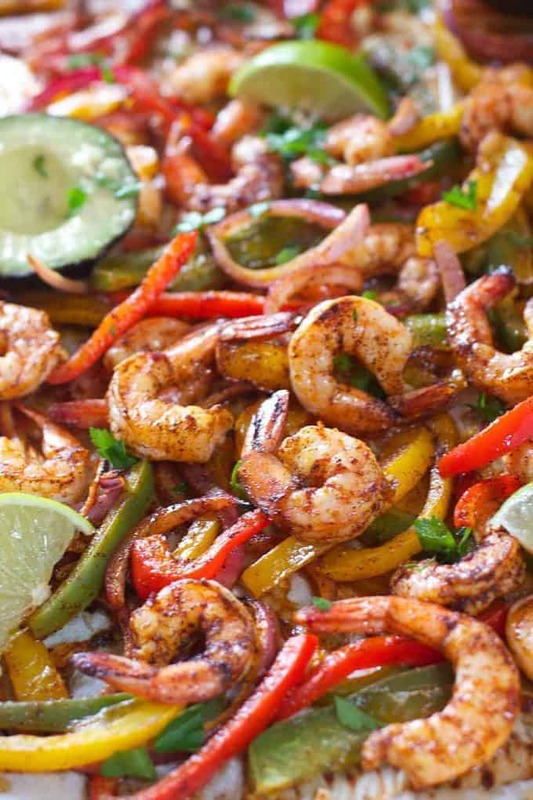 This healthy, fast and fresh fajita dinner will become one of your favorite go to meals! Line baking sheet with foil or parchment paper for easy clean up. Mix olive oil, chili powder, crushed pepper, cumin, garlic, juice of 1 lime, salt and pepper in small bowl or measuring cup. Bake for 8-10 minutes or until veggies are soft and starting to brown and shrimp is cooked through. Serve with remaining lime slices. Slice the veggies on the thin side so they get done as quickly as the shrimp. Add extra spices to the olive oil if you like a more kicked up version. I used Costco Shrimp 31-40 size. Raw with tail on. We have made this recipe a couple of times now and it always gets big “mmmm’s” from the family! 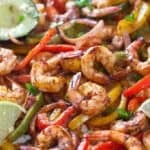 The combo of the spices and the lime juice on the shrimp and veggies is great. This is a big hit! Just made this – so good!! Thank you for sharing this with us! Just made this tonight and it’s spectacular! Definitely something we will eat regularly. Makes Whole30 easy!! Thank you. Today is day one for me of my Whole30 and I couldn’t have asked for a better recipe to start my journey! I made these for dinner and they were so easy to prep and tasted AMAZING! I did a romaine lettuce wrap and yummmmmmmm! Thanks for sharing your amazing recipes. Your lemon rosemary chicken is next on my list! Thank you for the nice note Leanne and good luck on your Whole30…I sure need another one! Hi Meredith – I don’t think it is a great candidate for freezing. The shrimp would get tough and the roasted veggies very limp. Chicken Fajitas would be a better choice but again…probably have veggie ‘issues’ :). Wow I am glad I found this blog! I just started blogging for my pwn reference (and sanity) as I just started Whole30 last week. All your recipes look great — I will make my way through a few this week. Thank you! I’m all in with the Spanish rice and Corn/Avocado salad too! Literally drool-worthy! Pinned. OMG…this dish looks amazing! I’m going to cook this dish for my family this weekend. Thank you for sharing. Hope you guys love it and thank you for the note!